Custom Furniture has been a specialty of Weberdings' for over half a century. Custom Furniture is our specialty. We work with the customer one on one to make sure we will be making the furniture to their specification and satisfaction. We make custom furniture for homes, offices, restaurants, businesses, etc. We always make a sketch or formal drawing and present to the customer for approval. We do our own designing but also work with other designers and architects. After our drawing is approved we begin the process of making the product. The first step is to pass the drawing on to our craftsman and he will start from scratch with getting the lumber out, glue, clamp, cut and shape all to very specific measurements. When the items are finished they go to our staining and finishing room. We hand rub on the stain and wipe off, then we spray our pieces in a very professional manner. We feel the quality of our furniture is the best you can buy. These are pieces that could become family heirlooms. Our customers are individuals who cannot find what they are looking for in a store and want the kind of quality we provide. 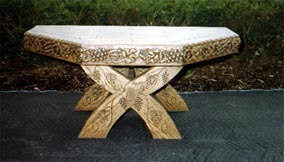 Through the years we have been given many opportunities to make beautiful pieces of furniture. 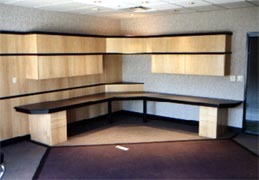 Our cabinetry work includes display cabinets, bookshelves, wall units, etc. We make these items to compliment the area or room they are in. The following pictures are units we constructed for personal homes. Shown is an extremely old beech beam taken out of a log cabin that was torn down. This beam was salvaged, cut to 75 inches, wire brushed, and now carving the oak leaf and acorns on each end. Later, we will tint the leaves in autumn colors and sealed. Check in later for more pictures. We make tables, chairs, hutches, bars and entertainment centers as seen in these pictures. We build to fit the customer's needs. For example, we can build entertainment centers that have doors that close over the television so when you are not using the TV, you have a beautiful cabinet. Or maybe a customer would like an entertainment center and bar area. As you can see, there are many possibilities that can be incorporated. doors that were made for office buildings. We have made bedroom furniture, including headboards, footboards, dressers, nightstands, armoires, etc. Furniture for business has also been requested over the years. 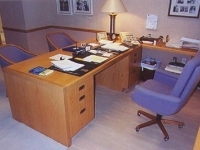 We make conference tables, cabinets, computer desks, wrap desks, decorative wall partitions, book and pamphlet racks, etc. We have been involved in executive offices, banks, reception areas, government buildings, museums, storefronts, etc. Schools also request items from our Company. Pictured is a podium we made for our local High School. We have made many of these for area schools. We have also had requests for trophy cases, display cabinets, bookracks, etc. Some of our miscellaneous items include crown molding chair rails, staircases, mirror frames, picture frames, shelving; anything that has to do with wood. As you can see we have many years of experience behind us and have made a variety of quality items. Please visit our other web pages to view additional aspects of our Company. Kitchen cabinets are a specialty. These can be made to compliment the design of the kitchen. Our custom-made tables and chairs could also enhance a dining room. We also make decorative moldings for kitchens as well as for other rooms in a home. Entertainment centers are popular at this time. We build these to fit the customers needs. We have made cabinets that have doors that close over the television so when you are not using the TV, you have a beautiful cabinet. We have also made a combination entertainment center and bar. As you can see, there are many possibilities that can be incorporated here. 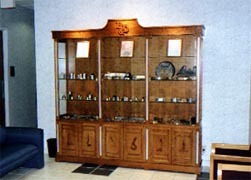 Display cabinets are also a popular item. Many companies have display cabinets in their lobbies and we make them to compliment this area and usually incorporate something to do with the company, for example their logo, or the product they make, etc. We have made bedroom furniture, including the headboard, footboard, dresser, nightstand, armoire, etc. We have also made custom closets including cedar lining a closet, making drawers, etc. Sometimes people cannot find what they are looking for in the stores and that is when they look for us. We custom build to the customers specifications. After our drawing is approved we begin the process of making the product. The first step is to pass the drawing on to our craftsman and he will start from scratch with getting the lumber out, glue, clamp, cut and shape all to very specific measurements. When the items are finished they go to our staining and finishing room. We hand rub on the stain and wipe off, then we spray our pieces in a very professional manner. We feel the quality of our furniture is the best you can buy. These are pieces that could become family heirlooms. Our customers are individuals who cannot find what they are looking for in a store and want the kind of quality we provide.